For 29 years, Western Display Fireworks has run the Blues Festival's annual Fourth of July pyrotechnics extravaganza. For 44 years—that's Heather Gobet's age—loud booms have been a lullaby of sorts for this native Oregonian. Gobet's family-owned business—established by her great-grandfather in 1948—produces around 350 fireworks displays a year. (And the Waterfront Blues Festival isn't even the biggest.) She got her start in the company working at fireworks stands. 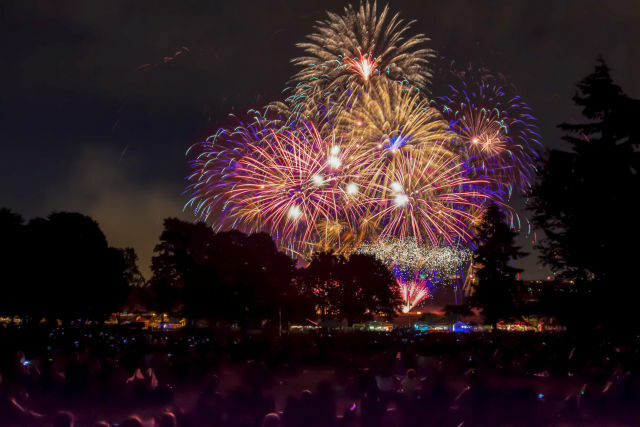 Now, as the new company president and owner, Gobet helps maintain the company's "inventory" of more than 27,000 pyrotechnic effects while also coordinating customized fiery night skies for weddings, parties, and Fourth of July festivals from Seattle to Fort Vancouver. We asked a very busy Gobet—the company's biggest weekend of the year, after all, is nigh—some of our most burning questions. What do people misunderstand about professional pyrotechnics? Heather Gobet: People think it’s a seasonal job; they ask, what do you do the rest of the year? It used to be—many, many years ago—that there was a two-or-three month intense work period. But now, with how our business operates, we’re doing fairs, festivals, sporting events and private events year-round. We actually place our orders for the next Fourth of July in August of this year. We’re literally ordering products almost a full year in advance. OK, so you'll receive the fireworks for the next Fourth of July—in 2017—this coming fall. How do you store explosives that won't be used for the better part of a year? We have a 155-acre site in the South Willamette Valley where we have several military grade storage magazines. That’s where all the product is stored. There are a number of different safety procedures that we follow in handling the product. It’s all stored in a manner that prevents penetration into the magazine. So what does the show preparation process look like ON Independence Day? The planning’s been in place for upwards of ten months; even now we have already started to deliver equipment and stage it all over the Northwest. Over the next two weeks we’ll have equipment trailers and trucks stationed at different distribution points, so the equipment can be delivered early. But, the actual fireworks themselves, in most every case, have to be delivered the day of the show. How do you get the special fireworks that you set off each Fourth of July? Do you get a big-kid pyrotechnics catalog you browse through? We actually have been doing business with the same companies clear back to when my grandparents were in the business. But basically the suppliers will send you a detailed list of all of their products—usually thousands and thousands of items—and we watch videos, we go to the different industry conferences to see their different product demonstrations. We add new products as we are made aware of really special suppliers. We'd sure like tickets to those conventions. Or maybe get a front-row seat with you on the pyrotechnics barge this weekend... How many people actually assist in setting off the pops? On a show the size of Blues Festival, there’s typically 10 people that set up the display and then execute it. Only ten? We figured there’d be more required for a 22-minute show. We have a philosophy that you keep your crews adequate to get the display done, but you don’t want excess personnel there, especially untrained people. You just have a core group of people that know what they’re doing to execute the display. That’s really important for safety reasons. Speaking of safety, those of us DIYing our fireworks here in Oregon are limited to those that shoot no more than 12 inches off the ground. But of course, every year someone still gets it in the eye. Any tips for us amateurs? There are a number of opportunities to buy legal products here in the state of Oregon. I think it’s a great tradition and I think it's definitely something that you want adult supervision for. You want to make sure that you’re clear of any combustible material and you want to be aware of what the product you’re shooting does. 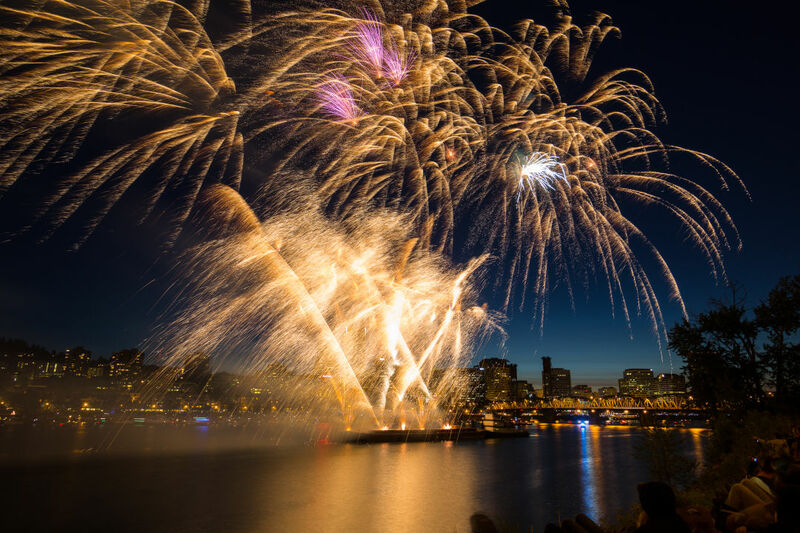 The Blues Festival's 2016 Fourth of July fireworks show launches at approximately 10 p.m. from a barge off the South Waterfront District in the Willamette River.